How are extended reality (XR) technologies contributing to research at UGA? This hands-on demo session and discussion will provide an overview of activities with participation from faculty and students in the College of Engineering, Lamar Dodd School of Art, Institute of Women’s Studies, College of Environment and Design, College of Education, Science Library Makerspace, and Grady College of Journalism and Mass Communication. 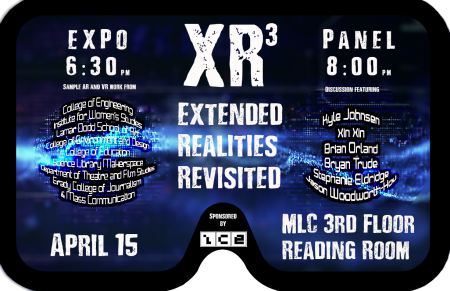 From 6:30 – 8 visitors can experience virtual and augmented reality projects, followed by a panel discussion with faculty and students. This is a free event and any AR or VR beginner, hobbyist, or expert is encouraged to attend. Hosted by Ideas for Creative Exploration.